This season of A Chef’s Life (check your local listings here) takes to the road as Vivian promotes her first book, Deep Run Roots, but before that, she'll pile in an RV with Warren and her team en route to Lambstock. We all know that Vivian has become no stranger to travel over the past decade, trekking across the US to cook at different events and festivals. But while her schedule has blossomed, at least one thing has remained constant during her culinary adventures — her knife roll. However, the leather bound satchel nesting her favorite kitchen gadgets hasn’t always been a ride-or-die luggage staple. GOL: Tell us about his rolled up satchel of utensils you’re always carrying around? VH: Sometimes I feel like I don't fit into my profession in a lot of ways. For one, I'm not really knife or gadget obsessed. 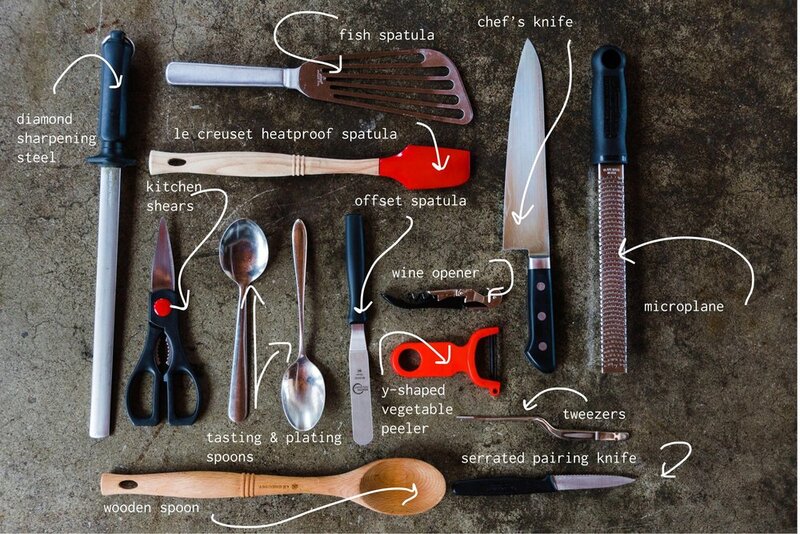 Some chefs have a load of knives and many chefs collect and get really jazzed over kitchen gadgets. But that’s something I've never been into, so sometimes it makes me feel like I don't really fit in. Five or six years ago when I started doing a lot of my traveling and cooking with other chefs, I realized that everybody else had these banging knife rolls. And I don’t mean just a run-of-the-mill knife roll but a cool knife roll — something that represented their aesthetic and their degree of gadget obsession. I didn’t have anything like that. I’d show up with a single knife wrapped in a towel. GOL: Why do knife rolls matter so much? VH: When I first started cooking on the road, I began to realize there were some things that are appropriate to ask for in other people's kitchens and some things that are not. Now I understand the distinction between kitchen equipment and personal equipment. The knife roll really represents your personal equipment, the things things that you shouldn't ask for. GOL: So how did you graduate from the towel? VH: Four or five years ago, I remember cooking next to Mike Lata for the Southern Foodways Alliance. He had this pristine, super clean, suede looking knife roll. And here I was with my knife wrapped in a towel. That was the moment I told myself, ‘Vivian, if you want to play with the big boys you gotta get some gear.’ So I ordered my first knife roll, aside from the one provided for me in culinary school. And mine actually isn’t even a knife roll. It's a bartender's satchel. But I got this one from Moore & Giles, because I thought it looked cool. I really liked the oilcloth and, unlike a lot of knife rolls, it's not set up with a ton of spaces for gadgets. So I felt like it would fit my degree of gadget interest. GOL: Generally, what do you keep tucked away in your roll? VH: I generally work with one chef's knife at any given time. I really like my Chubo knife. It was a gift in a goodie grab bag from Feast Portland. I like that it's light weight and the blade is very thin. It's easy to sharpen and it holds an edge. I always have a diamond sharpening steel. There’s lots of different types of sharpening steel steels but I like the diamond steels. I always have a y-shaped vegetable peeler. I cannot bear to use a regular, straight vegetable peeler. For me, I think they're dangerous and they slow me down. I always have a serrated paring knife which is about five dollars in any kitchen equipment store. And they don't last that long. But I'll use them for about three months and then lose it. Then I'll get a new one. I do keep some tweezers in there. I like them for plating and placing garnishes. A wine opener because you never know when you're going to get to a hotel room and there's no wine opener. It doesn't have a lot to do with cooking, but it’s my way of safeguarding against not having a wine opener. My little offset spatula is useful for a lot of things. I use it for turning little johnny cakes, something I do on the road a lot, smearing anything out, and plating stuff. It is just a good guy to have around. I also always have to have my Le Creuset heat proof spatula. Its particular size is really important in a professional kitchen because we do a lot of things in the blender and there's a lot of stuff that gets trapped in the bottom below the blade. A regular size spatula can't get in there. But this size is good for that and any other thing that you use a spatula for. My fish spatula is personal, so that goes with me, plus it’s a super useful tool. Wooden spoons are also pretty personal, so I have my own wooden spoon. Kitchen shears are another one of those personal things in a kitchen that you would never ask someone to borrow. And a microplane. Always a microplane. Yet again another thing that’s not necessarily cool to ask for in somebody else's kitchen partly because they wear out so quickly. So I come prepared with my own. Ands then spoons — plating spoons and tasting spoons. As a chef, that’s something you always want to travel with. For many chef’s that's something that's incredibly personal. I definitely have spoons that I like but they're not special, other than the fact that I lift them from Chef and the Farmer’s kitchen which gives me kind of an endless supply. GOL: Has there been anything that’ve you’ve included in the past that you’ve found not to be useful or are there things you wish you had in your kit? VH: Well, I really like to use a bench scraper as well as a mandolin. And those are also things that you wouldn't ask for in someone else's kitchen. But they don't fit in here. GOL: Is a roll like this something a home cook should have? VH: You know I don't think the home cooks necessarily need a knife roll. But I think the contents are important for every kitchen that has someone in it that likes to cook. GOL: Where do you like to get your kitchen gear? VH: I don’t think that’s as important as people finding things they like and that work well for them. Everything that I’ve mentioned here you could buy from JB Prince. I don't know if it is anymore, but it used to be the place where chefs shopped for all that kind of stuff. I also think Korin is a great resource for knives.